"Conceptual only, subject to change without notice," reads the apt stamp on a rendering of the now dead Durham Orange Light Rail project. Herald-Sun reporter Tammy Grubb, Durham Mayor and GoTriangle Board Member Steve Schewel, Communications Co-Chair with Partnership for a Healthy Durham Kevin Primus, and Brookings Institution Metropolitan Policy Program Fellow Adie Tomer join host Frank Stasio to discuss the demise of Durham-Orange Light Rail. The project has been in the works for decades and was slated to be an economic boon for the Triangle. A number of significant obstacles emerged during the planning process, including Duke University’s recent refusal to sign cooperative agreements needed to secure federal funding for the project. Host Frank Stasio speaks with reporter Tammy Grubb of The Herald-Sun; Durham Mayor and GoTriangle Board Member Steve Schewel; Communications Co-Chair with Partnership for a Healthy Durham Kevin Primus; and Brookings Institution Metropolitan Policy Program Fellow Adie Tomer. 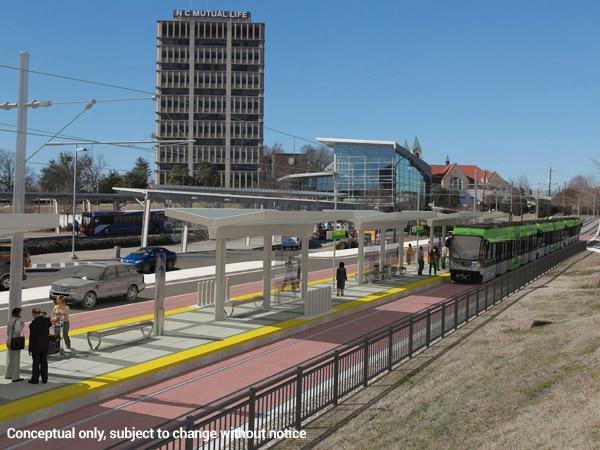 Duke University refused to sign a cooperative agreement on the Durham-Orange light rail plan last week. School officials said they were concerned the project could disrupt sensitive medical equipment along the planned route near Duke Hospital.